Does your child love to draw? This FREE contest can encourage their talent and artist expression! It’s fun just to enter and one design will be selected and crafted into a special jewelry piece. The winning entry will be selected by a panel of local judges. The contest winner will receive his/her custom jewelry by May 11, 2018. CONTEST RULES: Youth ages 5-12 are eligible to enter. Artwork submitted must be original and created by the child. 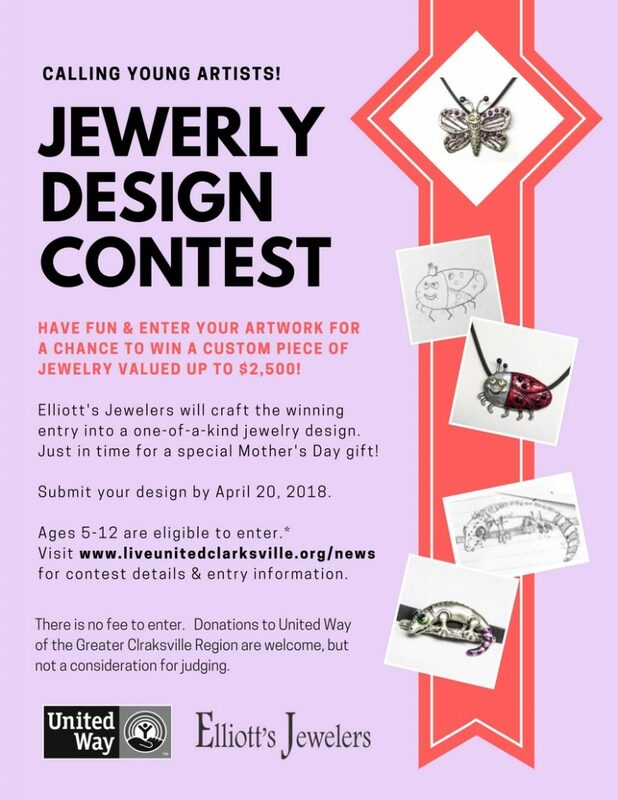 Parents must sign the entry form granting permission for the artwork submission and its reproduction for jewelry design and promotional purposes by Elliott’s Jewelers and United Way of the Greater Clarksville Region. DONATIONS to UNITED WAY: This is a free contest. No financial contribution is required to enter, nor will a donation be a consideration for artwork judging. If you wish to help United Way fight for the education, health and financial stability of local residents, donations are always welcome. Contributions can be made here via PayPal or received at the United Way office, 529 N. Second Street, Clarksville, TN 3704o. Donations are independent of the contest and will not be a consideration for contest judging.